Here are some facts about the Hoover Dam. The Hoover Dam is located on the border of Nevada and Arizona, on the Colorado River. It is located near Boulder City, a town built to house the 16,000 dam workers. The dam was built during the Depression, between 1931 and 1936 to prevent flooding in the region, as well as bring irrigation and hydro-electric power to arid areas. Hoover Dam was one of the largest man made structures of its time, and was an impressive engineering achievement. The dam is 1,244 feet across and 726 feet high. The dam contains more stone than the Great Pyramid at Giza and weighs over 6.6 million tons. The dam’s huge generators can produce about 3 million horsepower of electricity. The concrete needed for the dam’s construction was delivered by an overhead cable system. Loose rocks were blasted from the cliffs by men known as ‘high scalers’, who dangled precariously above the floor. The dam was first opened for tours in 1937, attracting about half a million people a year by the early 1950s. Today, several million people visit each year. About 100 of the 16,000 people involved, lost their lives during the construction of Hoover Dam. Special cooling tubes were used in the concrete to build the dam. It is estimated that if traditional methods of construction were used, it would have taken over 100 years to build. Lake Mead, with an area of 247 square miles, was created when the dam was opened. The construction and opening of the dam was also partially responsible for turning nearby Las Vegas into a popular resort. 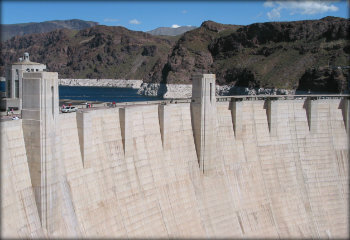 The Hoover Dam police are responsible for safety and security at the dam and the surrounding area. In the 1997 film Fools Rush In they helped a woman to give birth on the dam. THANKS FOR THE INFO !!!!! visited the hoover dam this past month, was amazing to know more!